Step 3. Erasing the guidelines of Step I, the artist begins to define the features more precisely. He draws the slender eyelids and constructs the blocky end of the nose—with the one nostril wing that shows in this three-quarter view. Now you see the familiar wingtike shape of the upper lip. The artist adds a curve just above the chin to define the bony shape. He squares up the corner of the jaw and then moves upward to draw the internal detail of the ear. 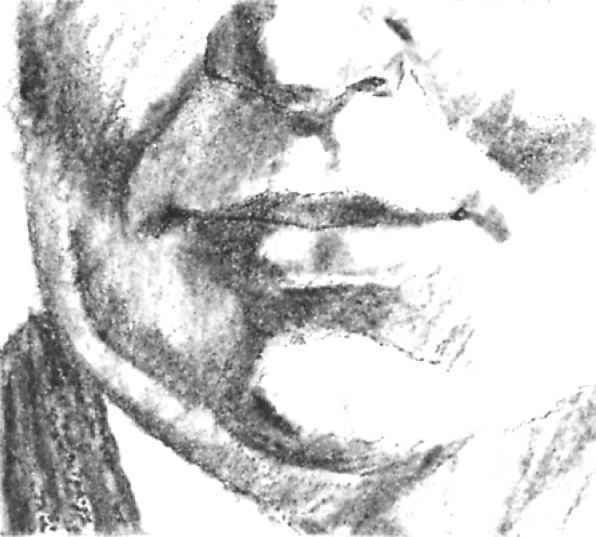 On the hard surface of the paper, chalk sometimes smudges or even disappears; this has happened to the line of the jaw just to the left of the mouth. But the line can be easily redrawn in the next step. Step 4. The rectangular stick of hard pastel is still fairly sharp, and so now the artist blocks in the tonal areas with clusters of parallel strokes. Notice how the strokes change direction as they move downward from the brow to the cheek to the jaw, following the direction of the form. 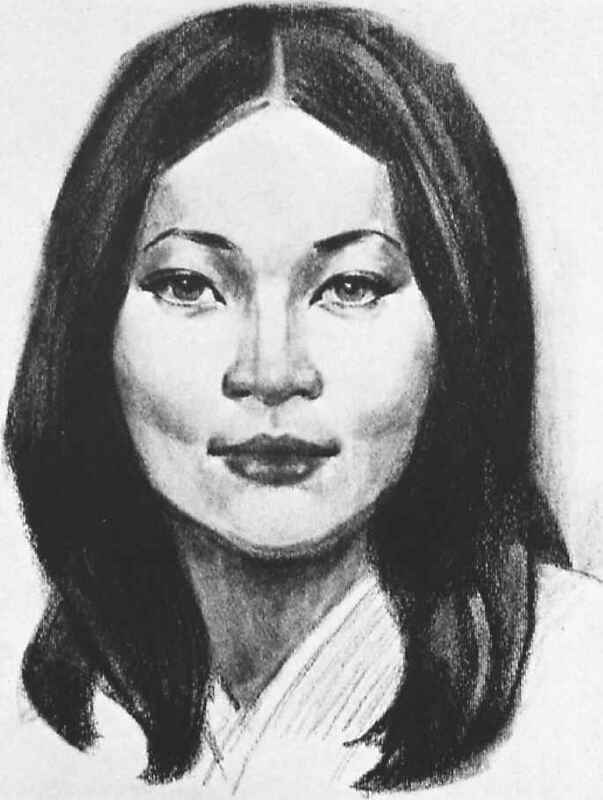 The tone on the slanted side of the nose is rendered with slanted lines. 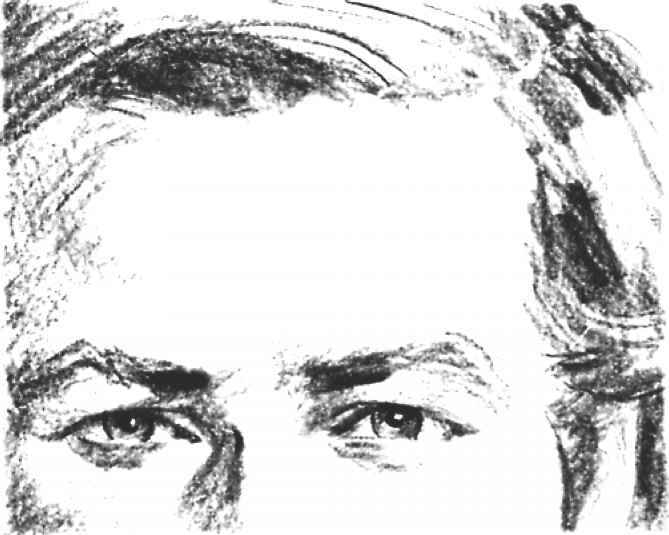 The artist fills the eye socket with tone; places the shadow beneath the nose: fills the upper tip with shadow; and indicates the deep shadow beneath the lower lip. With the flat side of the stick, he blocks in the tonal areas on the hair. Then, sharpening the stick once again, he adds more detail to the eyes and ear. Step 5. Moving a fingertip gently over the surface of the drawing, the artist blends the strokes of Step 4 selectively. He gradually blurs the tones on the side of the brow, cheek, jaw, and neck, but doesn't eliminate all the strokes. You can still see some of them, in the same way, he gently merges the strokes within the eye sockels, along the side of the nose, and beneath the nose and lower lip. A few broad sweeps of the thumb convert the strokes of the hair into tone. The sharp point of a stomp gets into smaller areas such as the eyebrows and eyes in order to fuse the strokes. Turning the stick of hard pastel to the opposite end and working with the flat tip, the artist adds dark strokes to the hair, eyebrows, eyes, cheek, and jaw, sometimes blending them with a fingertip and sometimes leaving them alone. With the side of the chalk, he adds a dark tone above the head and then blends this with his thumb. 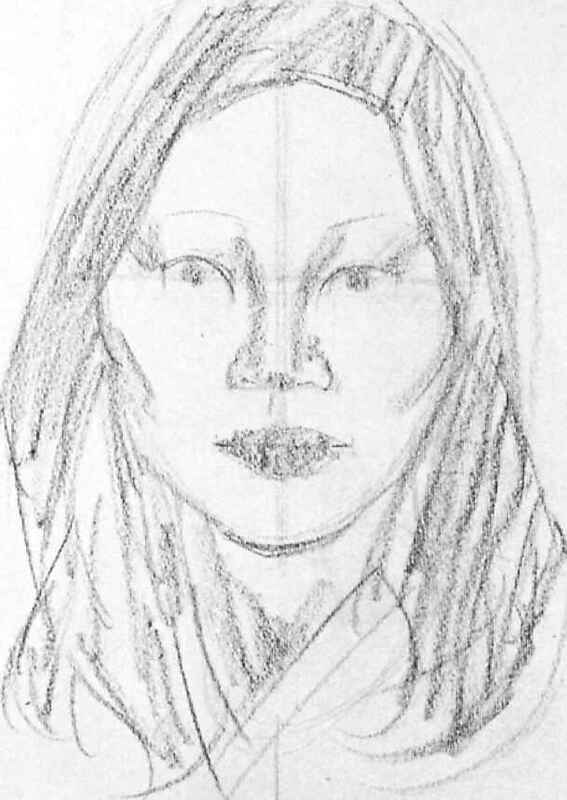 Step 6, The sharpened end of the chalk defines the outer contoujs of the face more precisely: compare the check with Step 5. 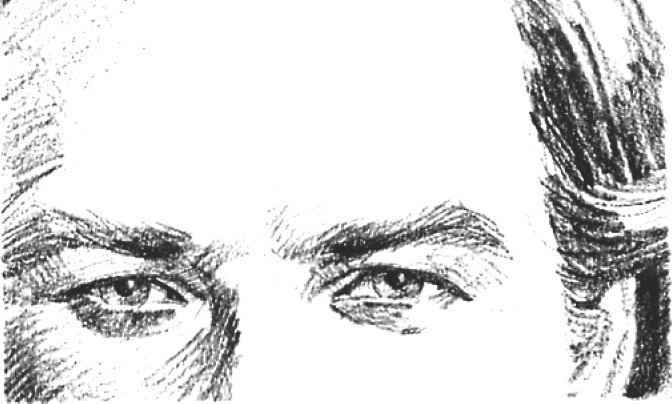 The artist then draws the eyelids more exactly, adding the pupils and the dark accents at the corners of the eyes. He defines the nostrils and the shape of the upper 3ip, darkening the corners of the mouth. He adds more darks within the car. Then he continues to strengthen the darks by adding clusters of short parallel strokes to the eye sockets, the lip of the nose, the brow, and the check, blending these with a fingertip or a paper stomp. The side of the chalk darkens the hair and shoulders with broad strokes, which arc quickly Mended with the thumb. Step 7. The artist presses his fingertip against the sandpaper pad, picks up some chalk dust, and gently spreads this tone over the shadow planes of the face: the forehead, cheek, jaw, neck, eye sockets, nose, and lips. In the same way, he adds tone to the neck, hair, car, and col lar. The point of the chalk darkens the contours of the eyelids, plus the tones of the eyebrows and lips+ A kneaded eraser brightens the lighted patches, and a razor blade scratches highlights into the eyes. Step 1- Chalk smudges so easily that you can blend it like wet oil paint. Now try a portrait that consists almost entirely of soft, blended tones. 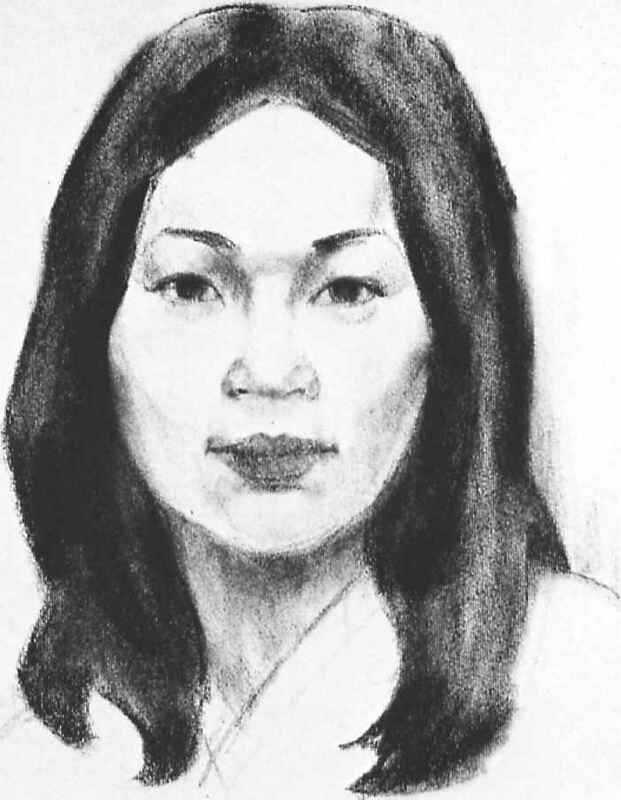 The artist draws this portrait of an Oriental woman with a stick of hard pastel on a sheet of charcoal paper. This type of paper has a hard, delicately textured surface on which chalk can be blended very smoothly- The tough surface will take a lot of tubbing from a fingertip, a stomp, or an eraser. By now, Step I is familiar: the classic egg shapeT cylindrical neck, and vertical and horizontal guidelines to locate the features, However, as you look back at the various demonstrations you've seen so far, notice that not all the egg shapes are exactly alike. There are subtle differences in height and width. Some arc tall and relatively slender, while others are rounder, like the soft form of this woman's face. Step 2, Over the guidelines of Slep ln the artist constructs the actual shape of the head and hair. He defines the curves of the cheeks, the squarish shapes of the jaw, and the rounded chin. With long, curving lines, he draws the sweep of the hair that surrounds the entire head and neck. A few slanted lines suggest the collar, The features are hung on the horizontal guidelines within the egg. Notice that he indicates not only the eyes, but also the inside corners of the eye sockets on either side of the nose. The lines in Steps I and 2 are executed with the sharp corner of the rectangular stick of chalk. As one corner wears down, the artist turns the chalk in his hand and uses the next corner. The corners stay sharp just long enough to exccutc the preliminary line drawing. Step 3* The artist uses the square end of the chalk to block in tones with broad strokes. A single curving stroke is placed on either side of the nose. A few more short strokes suggest the shadows around the nostrils and beneath the tip of the nose. 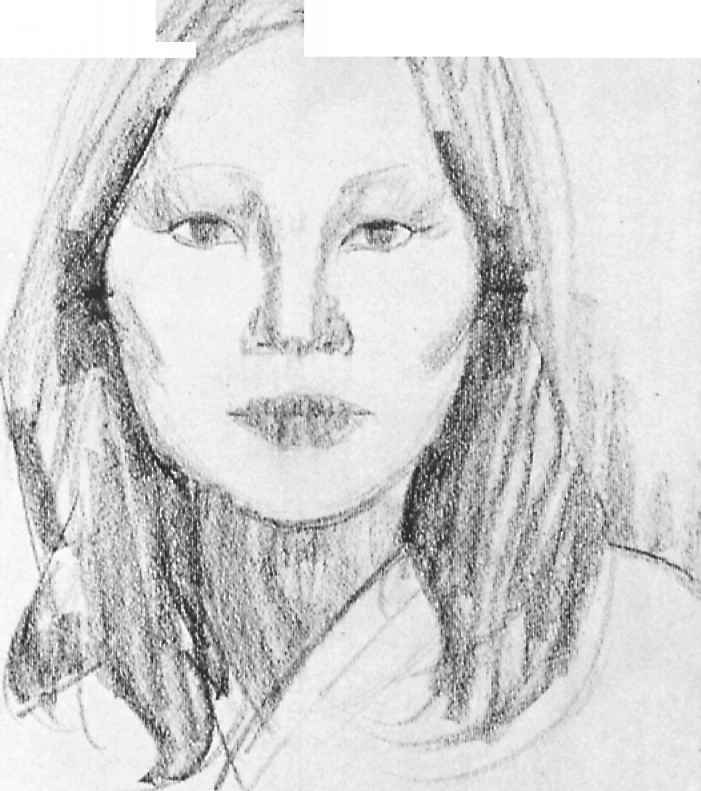 Short, broad strokes place the shadows in the outside corners of the eyes, along the cheeks and jaw, and at the pit of the neck. The lips arc filled with tone. The dark irises are made with quick touches of the blunt end of the chalk. 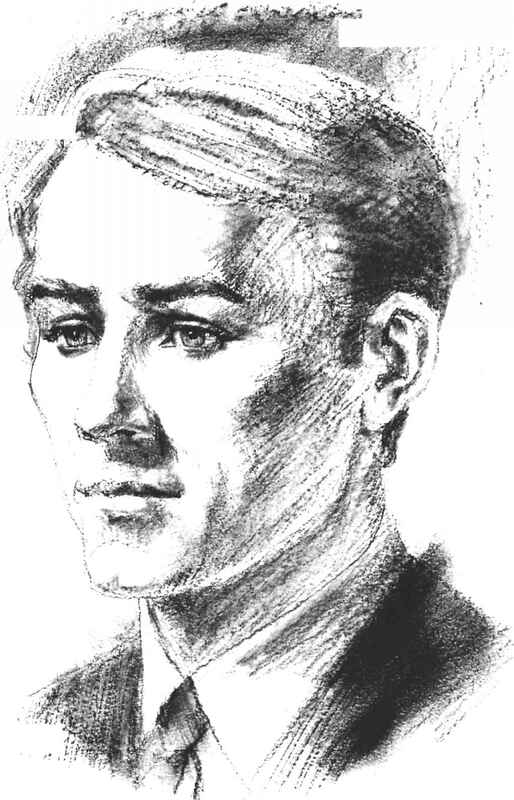 And then the hair is filled with long, free strokes to indicate the dark tone, At this stage, the chalk glides lightly over the surface of the paper, merely indicating tonal areas that will be developed in later steps. Step 4. Pressing harder on the square end of the chalk, the artist darkens the irises and extends the shadows on cither side of the nose. Then, with the sharp corner of the stick, he draws the dark lines of the eyelids and the nostrils. Moving the blunt end of the stick lightly over the paper, he gradually darkens the tones within the eye sockets. He picks up a short chunk of chalk—perhaps a broken stick or simply one that's worn down—to darken the hair and neck with broad strokes, He uses the flat side of the stick and presses down harder against the paper. Step 5. Moving a fingertip gently over the paper, the artist begins to smudge the strokes within the eye sockets, beneath the nose, and along the sides of the checks. With a kneaded eraser, he lightens the shadows on either side of the nose. He blends the strokes on the neck, blurring the line of the chin. With the flat side of tiie short chunk of chalk, he darkens the hair and blends this area with his thumb, carrying some of the hair tone into the shadows beneath the cheeks. He blends the lips very slightly. Then he uses the sharp corner of the chalk to redefine the eyebrows, eyes, nostrils, and lips, softening these strokes with a quick touch of a fingertip. Step 6. The artist's thumb and one or two lingers are now coated with chalk dust. He uses his fingers like a brush to spread tones on the sides of the forehead, beneath the cheeks, along the sides of the jaw, and on the neck, which grows distinctly darker than in Step 5+ The finger places very pale tones on either side of the nose and darkens the corners of the eye sockets, llien the sharp comer of the chalk restates the eyebrows, eyelids, nostrils, and lips. Small, precise strokes add pupils to the eyes, sharpen the nostrils, and define the dark corners of the mouth, The llat side of the short chalk sweeps over the hair with long, broad strokes, A kneaded eraser is squeezed to a point to pick out highlights on the pupils, brighten the whites of the eyes, clean the edges of the lips, and create highlights on the lower lip. Step 7. The artist blends the tone of the hair with his fingertips, blurring the contours and adding a few strokes to suggest detail. His fingers arc coated with chalk dust, which he carefully spreads over the face to add delicate halftones to the forehead, cheeks, and jaw, and to darken the neck and the underside of the nose. The kneaded rubber eraser brightens the lighted areas of the forehead, eye sockets, cheeks, nose, upper lip, and chin, The sharp corner of the chalk strengthens the upper eyelids and adds a few eyelashes. Slender strokes. A hard or medium charcoal pencil can be sharpened to a fairly precise point to make crisp strokes. The tones of the sitter's hair, forehead, and eyes are built up with clusters of parallel strokes made by the sharp point. The artist builds one cluster of strokes over another to darken the tones within the eye sockets, beneath the eyes, and along the side of the nose, The slender strokes in the hair are made by the point of the pencil, while the broader strokes arc made by the side of the lead. Broad Strokes. A soft charcoal pencil has a thick lead that's suitable for a broad-stroke technique. So does a stick of charcoal—in your hand or in a holder. 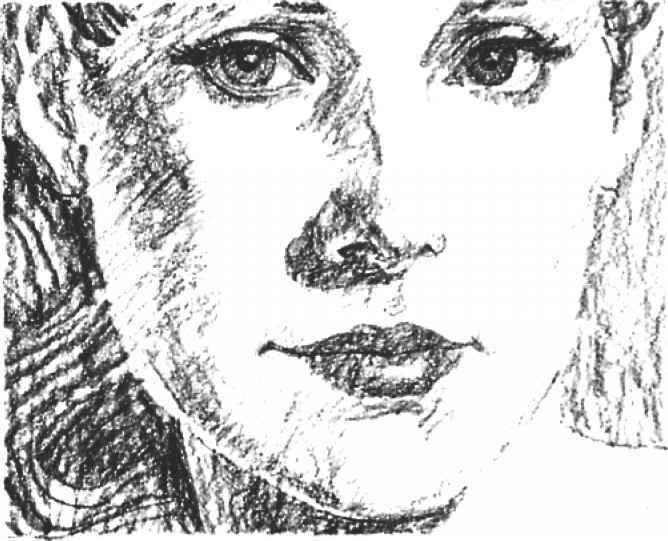 Compare the wider, rougher strokes in this drawing with the more precise strokes in the drawing at the left. 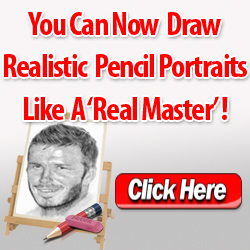 The soft charcoal pencil or the charcoal stick can be sharpened to do a certain amount of precise work—such as the slender strokes in the hair and within the eyes—but the point wears down quickly- Artists generally work with the side of the soft pencil or the stick to cover broad areas. Strokes on Charcoal Paper, The strokes of the hard and medium charcoal pencils are particularly effective on charcoal paper, as you might cxpect. The ribbed texture of the sheet softens the strokes, which are filled with pinpoints of bare paper. Look at the tones on the side of the nose and cheek, the shadow beneath the nose, and the dark tone of the lips—they seem transparent; and filled with inner light. The tiny flecks of bare paper make even the darkest tone look luminous. Strokes on Rough Paper. The strokes of a charcoal pencil or a stick of charcoal look lively and spontaneous on paper with a ragged texture. The granular texture of the charcoal is accentuated by the coarse surface. The strokes in this portrait are bolder—though less distinct—than the more sharply defined strokes in the drawing at your left. It's worthwhile to try rough paper because it encourages you to work with bold, free strokes. And you have to keep the drawing simple, since you can't build up too much detail. Modeling with Strokes. 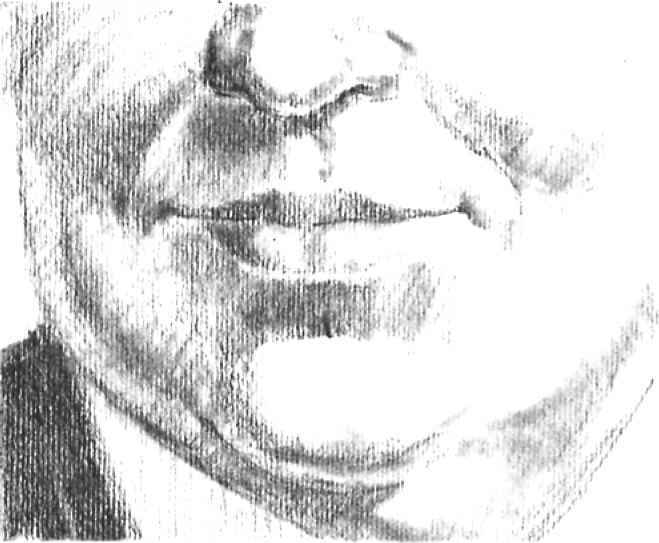 This face is drawn with hard and medium charcoal pencils. The artist builds up his strokes in clusters which changc direction as the form curves. Notice how the strokes wrap around the corners of the eye sockets and slant diagonally down the side of the nose, The groups of strokes gradually change direction as they move around the sides of the checks. 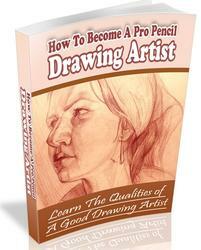 Don't just dive in and start scribbling! Plan your strokes. Modeling by Blending. A medium charcoal pencil blends easily, while a soft pencil or stick of natural charcoal blends still more easily. 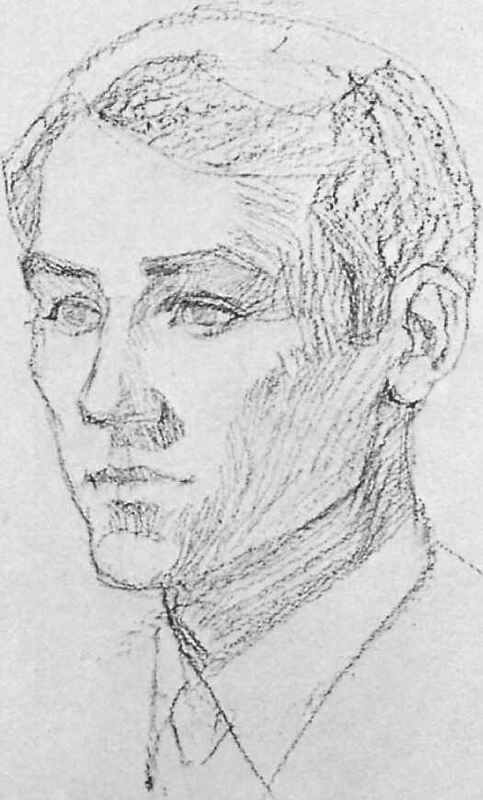 In this drawing of the same sitter, the artist blocks in the tones with broad, casual strokes and then smudges them with a fingertip to form soft, velvety tones. He doesn't blend the strokes so thoroughly that they disappear, but allows some of them to show through the blurred tones. You can see this most clearly on the cheek, within the eye sockets, and along the side of the nose, where the underlying strokes add solidity to the soft, misty veils of tone. Strokes and Blending on Charcoal Paper. 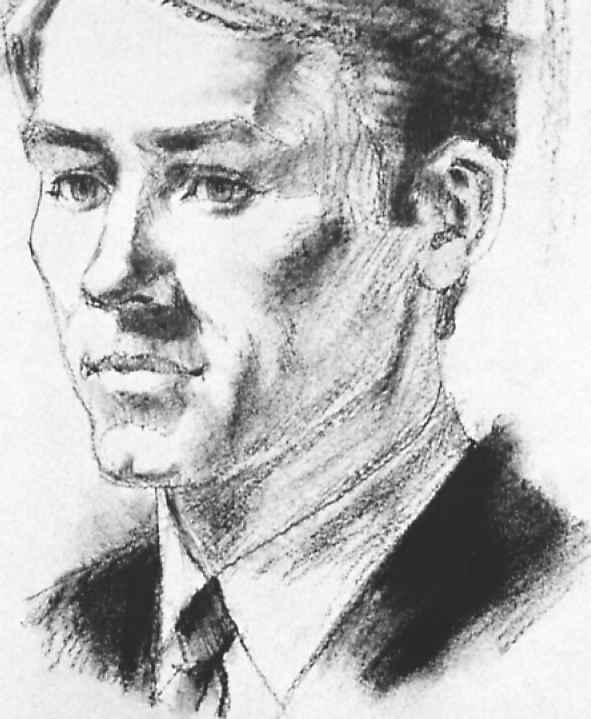 The hard surfacc of charcoal paper is ideal for a technique that combines slender lines like those along the bottom of the nose and between the lips; broad strokes like the ones on the shadow side of the face; and blended areas, which you see throughout this close-up of a male portrait, The artist uses a sharply pointed hard charcoal pencil for the precise lines and edges in this drawing, switching to a soft pencil for the broad strokes and then blending the tones with a stomp. Step 1. Like graphite pencil and chalk, charcoal handles beautifully on any sturdy white drawing paper that has a moderate amount of texture—just enough to shave off the granules of charcoal as you move the drawing tool across the surface of the sheet. Charcoal blends so easily that it's always templing to smudge the tones of a charcoal drawing; but resist this temptation and begin with a portrait in which you render the tones entirely with strokes. 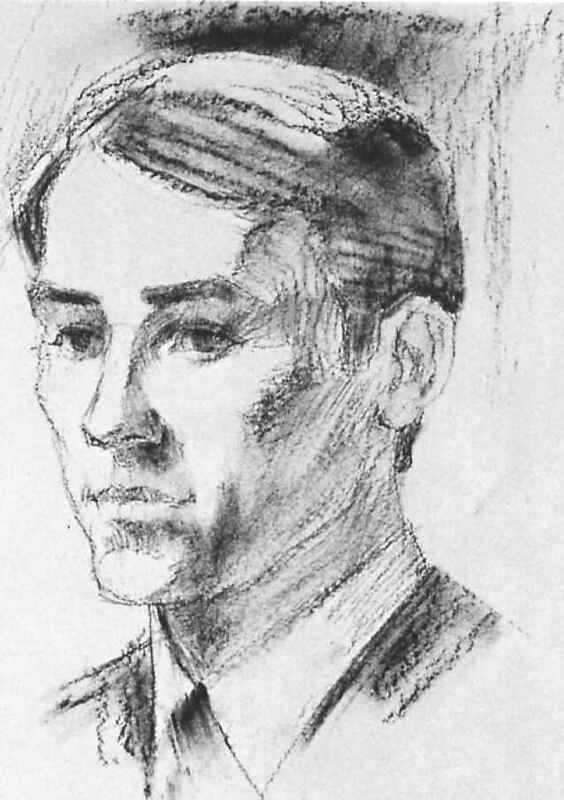 In this portrait, the artist uses a combination of three charcoal pencils: hard, medium, and soft. He begins with the hard pencil, sharpened to a point, for the preliminary sketch of the compound egg shape, with its vertical and horizontal guidelines. The head is turned to the right, and so the center line moves to the right too. Since the sitter's head is tilted slightly downward, the horizontal lines curve gently around the egg. 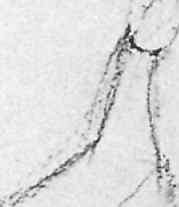 The artist follows these curves to locate the ear, which seems a little high on the head but actually aligns with the curving guidelines of the eyes and nose. 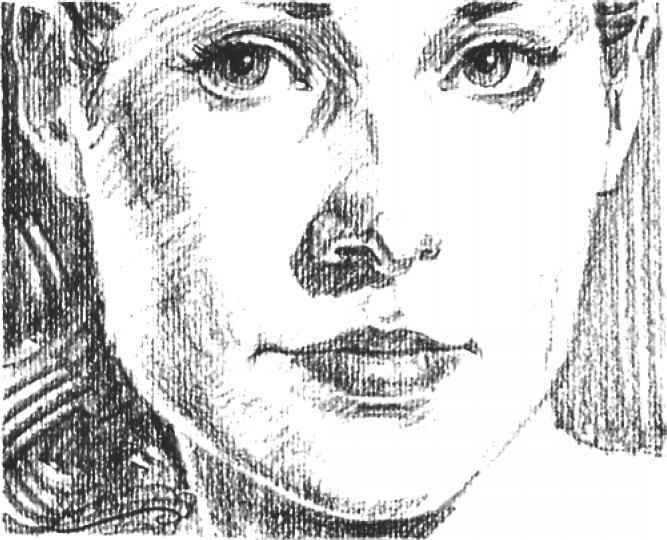 Step 2, The hard charcoal pencil draws the contours of the head and hair with pale lines— the artist doesn't press too hard, The eyebrows, eyes, nose, and mouth are carefully placed on the curving guidelines of Step 1. Because the head tilts slightly downward, the hairline seems to come farther down the forehead and we sec more of the top of the head. Curving lines wrap the shape of the hair around the top of the egg and bring the hair down around the sides of the face. Even at this early stage, the upper lip begins to have its characteristic double-wing shape. When the head is turned to a three-quar-tcr view, the vertical center line is particularly important in helping you line up the bridge and underside of the nose, the groove between the ft nose and upper lip, the center of the lips, and the midpoint of the chin. In this view, the eye at the right is close to the center line, while the eye at the left is farther away. How to draw seascapes in pencil? 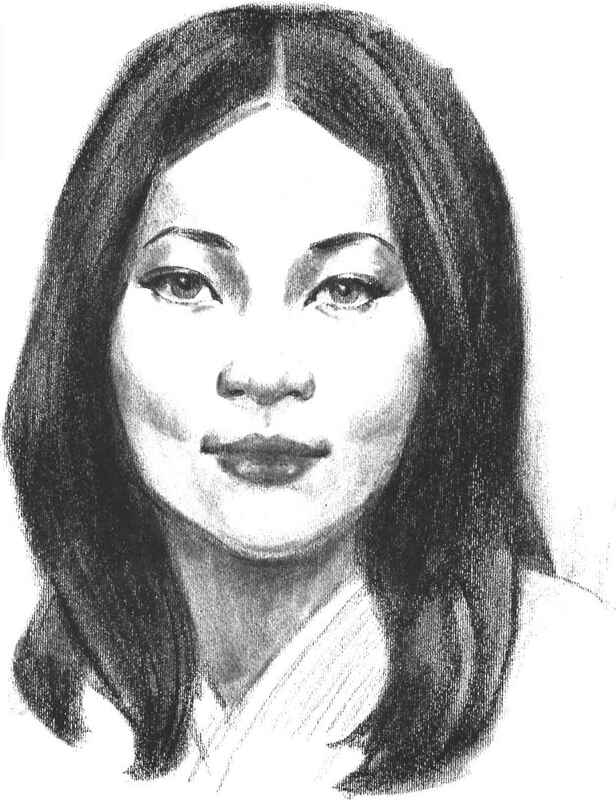 How to draw women portraits? How to draw a male face with pastel pencils? How to draw woman lips?